It has all the makings of an epic failure of an attempted robbery due to an inept and bumbling, fumbling suspect. The man suspected to be behind an armed robbery attempt didn’t bother to dress for success, so to speak, and it later proved to be a hindrance to his ill intentions. 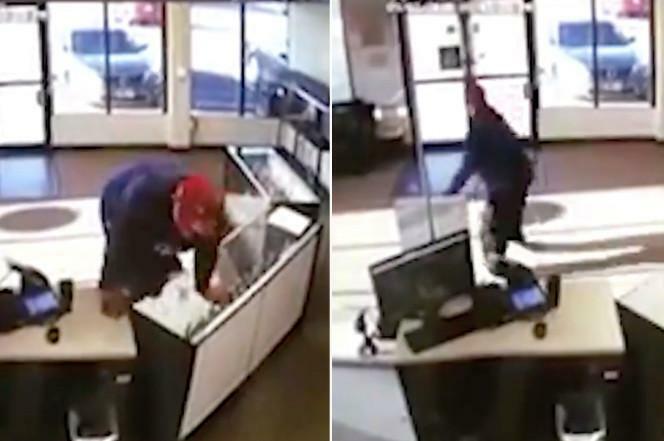 Police in Colorado said they are now looking for a man who fumbled his weapon and even- horror of horrors- briefly dropped his pants while attempting to rob an e-cigarette store in Aurora on Sunday. Video footage from the surveillance camera shows the suspect approaching the counter at eCig of Denver before pulling out a BB gun as described by the store owner to the police. The bumbling suspect also fumbled with the weapon over the counter and attempted to get it back before the owner managed to grab the gun from him. In seeming panic, the suspect then turned and frantically ran out of the store, jumped into the door and as if the spate of errors were not enough, he even momentarily lost his pants. The bumbling, fumbling suspect was wearing gloves at the time of the incident, but the store owner said the police still managed to gather evidence from the crime scene. Police are still searching for the suspect as of Wednesday. The authorities are requesting the public’s help in identifying and hunting down the suspect. Anyone with information or useful tip is requested to call Metro Denver CrimeStoppers at (720) 913-7867.
oh god, that clerk, the way she handles that gun. carrying it around by the barrel, pointing at herself. they really should teach safe firearm handling in elementary school. Just like I tell my paranoid friends, these crooks are not smart and have no plan "B" so 9 times out of 10 all one needs to do is mess up their simple plan. One friend carries a 45acp handgun and is worried it wont stop a bad guy. My opinion is that the bad guy will go full "ship to shore" and abandon all plans once he has a 22lr slug in his belly. But to this lady at least she had the fortitude to grab the gun ASAP, she just needs to know how to handle a firearm, bc if this guy had a backup plan she would most likely be dead or injured and the store would be robbed. If someone approached me in a threatening way holding a handgun by the slide it would only be seconds before I was the one with the gun in my hand proper like. 36279, see your point, but cops might be able to get better prints.